"I think queer people are taking ownership of their bodies and their experiences, more so now than ever." Singer-songwriter Richard Cortez is exploring his identity as an artist through his latest collaborative effort, working with a team of talented queer creatives across a multitude of mediums. 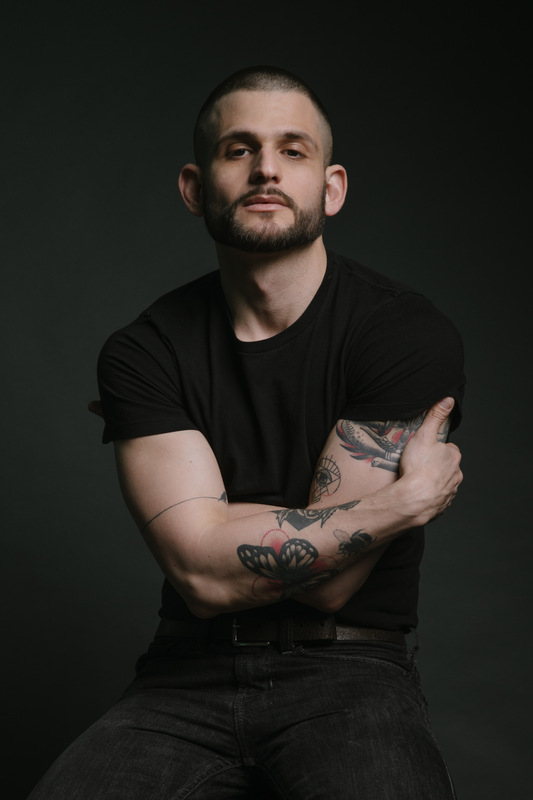 Cortez, who turned down a production deal when asked to present as “straight” in 2004, has been releasing independent, openly queer music on his record label, Wollenberg Records, for the past 13 years. But it’s his latest work — “The Welder & The Lark” — that is especially profound. Co-produced by Jordan Hall (Boy Radio), six original compositions subtly tackle themes of intimacy, monogamy, mental health, and heartbreak — all in less than 15 minutes. With three music videos filmed and directed by cinematographer Philip Campbell, each starring dancer/choreographer Christian Denice, “The Welder & The Lark” is a multimedia experience curated by an entirely queer team — from music production and performance through album artwork and cinematography. The final music video, “The Overture/Don’t Go, Not Yet.,” pairs the opening track of the EP and an overture composed by Witter that subtly marries melodies from each of the six songs from the project. We had the opportunity to ask Cortez some questions about this work, and the experience of working with so many incredible queer talents to make it happen. What is the story you're trying to tell with this work? When you love someone the way I loved him, you want to erect a statue of them. You want to buy a plot of land somewhere and plant hundreds of spring bulbs that flower year after year in their name. The kind of love where you'd wash and fold their laundry. In this work, I tried to fully realize and express a love that couldn't be because it was unrequited. What do you do with all the love you have for someone who doesn't love you the same way in return? Some people drown their sorrows in whiskey gingers, or "eat. pray. love." their way around the world -- I decided to spend every dollar I had on creating an infinite space where that love could live and be free. I wrote a collection of songs about how deeply in love with him I was and hard it was to let him go. But that wasn't a grand enough gesture. So, I called upon all of my favorite artists, of all different mediums, to help elevate and expand that space. We've been collaborating as a team on this project for a year. I never got to tell him I loved him, so I'm telling the world. What does this work say about gay male identity in 2018? I think queer people are taking ownership of their bodies and their experiences, more so now than ever. I would never presume to say that my work says something about gay identity as a whole. I believe culture, race, age, location, gender expression, experience and many other elements factor into the very complex and beautiful privilege of what it is to be gay in 2018. These songs tell the story of a broken heart through the various art forms of a diverse group of gay men. I am humbled and grateful to have worked with them and I hope our voice and shared experience, collectively, tells an informed, relatable story that fosters healing and release for anyone. This project is a huge collaborative effort of many queer artists who work across various mediums. What are some of the challenges to this collaboration, and what are some of the benefits? I walked into this project with only one rule: let these artists create their work, the best way they know how, without getting in their way. I gave as little direction as possible while still honoring my vision. I wanted to support and incorporate the people who's work I admired, and see what they created with my songs being the spine of this larger body of work. The only challenges I did face, ultimately became opportunities for growth. One of them being learning to continually trust and let go, allowing the true heart of collaboration to be the driving force of the project. I feel my work has been elevated in ways I never could have manifested on my own. This project exceeded my own expectations of these songs when I wrote them. What have you learned about yourself as an artist through this process? Overall, it was healing process, both artistically and spiritually. I learned to take my time. I learned to let my heart break without punishing myself for it. I learned that I don't have to be suffering to make relevant and impactful work. I learned a lot about trust and acceptance in collaboration. I learned to take bigger risks, both creatively and financially, as an independent artist. But more than any of that, I learned that loving the process of creation will always generate a beautiful outcome. I would do every moment of this all over again with this team any time. Now that this group of creatives has been assembled, what's next for the collective? I have no doubt this collective will continue to expand, make work together, and inspire each other. “The Welder & the Lark” is only the beginning. I plan to work with every single one of these artists again. To pre-order "The Welder & The Lark," head here.